This young lady has become our theme for the entire week, showing us that age is nothing but a number! 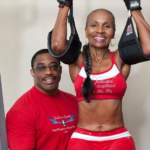 Our latest Woman Crush Wednesday, Miss Ernestine Shepherd, was the subject of the meme that became our lesson of the week in a recent Instagram post. In that picture, she was only 74. She’s now 81 and still going just as strong, still exercising more than women one fourth her age. She is the truest inspiration! After reading her story online this week, and I encourage EVERYONE to do so, I’ve received the answer to a question I’ve wondered about my entire life. Does the body break down due to time, or can an increased activity level keep it healthy longer? As a kid, I wondered why parents seemed to begin diminishing physically. Was it solely the passage of time or was it ALSO because they were so much more sedentary and less active? What comes first? The chicken (decreased physical activity) or the egg (body diminishment)? Miss Ernestine’s story has given me the answer I’ve always sought. Now at 44, I’ve been convinced to commit to a high level of physical activity for as long as I live. Thank you for the answer Miss Ernestine! And thank you for the endless inspiration! The Action Karate Plymouth family is full of inspirational people of all ages! Want to learn more? Click here for more information on Action Karate Plymouth.